We aimed for Gold and achieved it. In June 2016, Halifax Central Library project was given Leadership in Energy and Environmental Design (LEED) certification from the Canada Green Building Council. Sustainability in the context of a library meant that the building needed to be built to last, have the flexibility to respond to changing program needs, reduce its operational environmental impact, and support the social and cultural needs of its users. The Library’s public consultations clearly showed that “green design” was a high priority for the citizens of Halifax. The design team has worked hard to honour this commitment, and met it. LEED certification is an internationally accepted third-party verification of high performance green buildings. LEED promotes a holistic approach to sustainability by evaluating the design, construction, and operation of buildings in key areas of human and environmental health: sustainable site development, water efficiency, energy efficiency, responsible material selection, indoor environmental quality, and innovative design. Credits and prerequisites are organized into these six categories. A building is rated based on the total point score achieved, with four levels of certification (certified, silver, gold, and platinum). Rainwater sustains the green roof, which will in turn absorbs solar energy to reduce the heat island effect and provides a pleasant landscape to view from the top floor and the rooftop terrace. The Library will promotes alternative forms of transportation through the building's proximity to bus routes, secure on-site bike storage, and electric vehicle charging stations.? The building takes advantage of the region’s abundant rainfall by harvesting rainwater for use in the flush fixtures within the building. Regional, local, and adapted plants used in landscape and green roof design do not require irrigation. Computerized building management system optimizes energy use by mechanical and electrical systems. 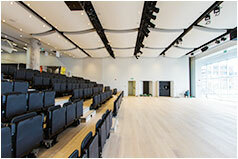 Automatic occupancy and daylight responsive control system reduces lighting energy use. Highly efficient heating and cooling system including, active 4-pipe chilled beam system, and high efficiency heat recovery ventilation units. Variable speed fan and pumping systems. Glazing of the facade allows for solar heating, thereby reducing heat loads. The concrete frame and floors provide inherent thermal mass, meaning that heat generated during the day—either by solar gain, equipment or people—is absorbed and emitted reducing the need for active heating at night. The cooling system has a radiative component to help maintain surface temperatures in the summer to improve comfort conditions. Enhanced digital metering monitors where energy is being used in order to help the Library optimize operations in the future. Materials selected to maximize recycled content: aluminum curtain wall, framing, steel, insulation, drywall, etc. Regional materials used throughout design: concrete, landscape materials, finish woodwork, etc. At a minimum, 50% of all wood used in the construction of the library is certified by the Forest Stewardship Council as sustainably grown and harvested. Low-emission materials—paints, coatings, adhesives, and sealants—are used throughout to maximize indoor air quality. All composite wood products are urea-formaldehyde free. All carpets are low-emission and meet the Carpet and Rug Institute Green Label IAQ test program. Plenty of daylight throughout reduces the need for artificial lighting during the day and improves the quality of spaces. Design provides connection to the outdoors through direct views from over 90% of the building. Reduces exposure of building’s occupants and maintenance personnel to potentially hazardous contaminants through a green housekeeping policy. The building actively informs the public about green building strategies and solutions through educational information available throughout the building.? 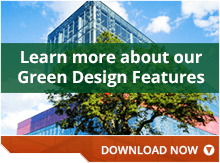 Learn more about our Green Design Features ?